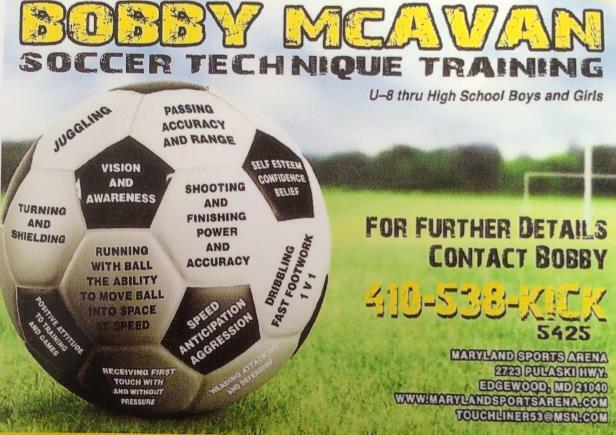 6 week programs with built in discounts or private one time lessons are now available with former MISL Championship player and Head Coach Bobby McAvan , to improve your child’s technical ability, confidence on the ball and passion for soccer. Harford County’s first authentic training studio is located inside the Maryland Sports Arena on Pulaski Highway in Edgewood (200 yds East of Home Depot) and features field turf, official futsal goal, quality age appropriate soccer balls and all training equipment to guarantee a positive learning experience for kids of all talent levels ages 7 and up. Each 55 minute lesson will include progressive training in all soccer skillsets and offer in excess of 500 touches on the ball. Parents can relax in a heated or air conditioned comfortable viewing area. 3 lessons for $210. The technical and mental dynamics of tryouts. Monday- Thursday, 2.5 hour sessions. 16 players max. $1,750 includes soccer ball and t-shirt. Mon-Thurs. 10am-3pm. Fun camp for boys and girls 6-14 yrs. old. July Season – Limited opportunity for personal training in Ocean City. Call for details.